Andrew Ebert, operations manager of Viscount Plastics with technical services manager Terry Collins. 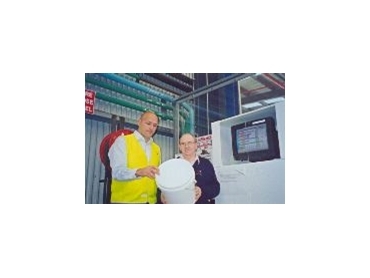 AspectPL, the production monitoring, scheduling and benchmarking software for manufacturing developed in New Zealand by Production Logistics , has assisted the Viscount Plastics group, one of Australia's leading injection moulders, achieve world's best practice. Viscount, a member of the Linpac Group, operates eight major plastics production facilities in Australia and a further five throughout South East Asia and employs over 1000 people. Thanks largely to AspectPL the performance achieved in Viscount's Auckland factory, where AspectPL was first implemented, is now being reflected in the group's other manufacturing sites. The achievements in Auckland included decreasing stock levels by scheduling more accurately in real time, increasing production by 15% year on year, reducing casual labour by 6 people a day for the whole year, increasing OEE by more than 10% in one year, increased uptime with decreased rejects, increased cycle efficiency, a 5% increase in on time deliveries and reduced raw stock material stockholding. Specific objectives sought by Viscount's management included the establishment and training of operational improvement teams, the setting of specific Key Performance Indicators (KPIs) and to empower its staff to foster ongoing improvement in performance. AspectPL monitoring and scheduling software automates the data gathering and analysis process and generates a single KPI known as Overall Equipment Effectiveness (OEE) which combines availability, quality and efficiency. AspectPL provides powerful reporting and analytical tools and allows users to "drill down" on top level factory OEE to identify the causes contributing to poor performance. OEE may be analysed by shift, operator, day, week, job, machine or a range of other attributes. The power of the AspectPL program enabled the Viscount team to monitor in real time the production performance and react quickly to problems as they were identified. With data gathering automated and information only a mouse click away, the focus has become improving efficiency and unlocking plant capacity with the benefits flowing through to both revenue and profitability. "AspectPL has made a major contribution to a change in our company culture and created a better workplace as our operators were involved in the improvement process," said Andrew Ebert, Operations Manager of Viscounts Melbourne operation. Viscount's quest for world's best practice has been aided by AspectPL real time scheduling and production monitoring software which provides up to the minute performance information with total visibility.